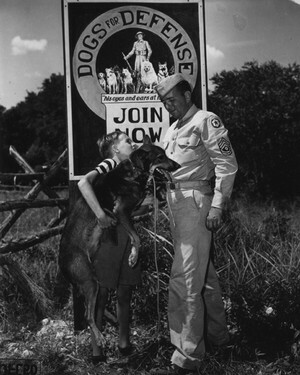 These K-9 Soldiers were deployed on every front; Europe, North Africa, and the Pacific. 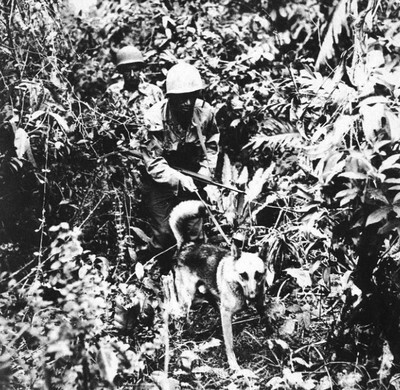 The dogs ran dispatches between units when normal communications were disrupted, they assisted in locating and even hauling wounded GIs, and they carried ammunition and medical supplies to troops in need during combat. Their small size and low profile aided in their usefulness and success rate in these tasks. 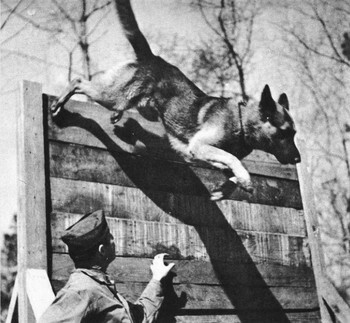 The K-9 units were probably most adept in the roles of Scout and Sentry. In the Pacific theater, U.S. troops faced an entrenched and often well-hidden enemy. The dense vegetation and topography made visual detection a challenge without modern technology like satellite imaging or infrared. With a well-trained scout dog and handler taking point, a patrol would be alerted to enemy movement and any ambushes. Some dogs were even trained to detect booby traps like trip wires and pitfalls. It’s been recorded that no patrol that had a scout dog ever came under fire without at least a few moments notice. The dogs and their handlers gained valuable field intelligence during every maneuver. 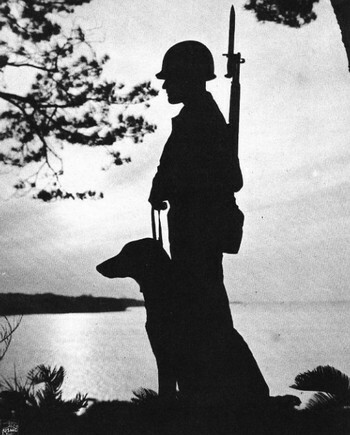 These dogs are credited with saving countless infantry lives. The GIs valued these dogs a great deal, and even went so far as to award them company citations for heroism. A number of dogs received combat medals such as the Purple Heart, but these were later rescinded when the War Department restricted these awards to humans. The pad-footed patriots were officially recognized for their service…eventually. The QMC released certificates for dogs who were discharged from service or were killed in action. When the war ended and troops returned home there was some concern about what would become of the dogs. Not all their owners were in a position to welcome them back. and a large number of dogs who were drafted into service from pounds didn’t have any owners. However, thanks to the Quartermaster Corps and the Dogs for Defense, every dog was put through a processing station in the hope they’d be able to return to civilian life. Sadly, a small number of dogs were suffering from combat stress or were otherwise deemed unfit to be repatriated; after attempts to rehabilitate them failed they were euthanized. Once the public was alerted to the fact surplus dogs were looking for a home, the influx of requests for adoption was staggering. Over 17,000 applications arrived, vastly more than the number of dogs available, and the requests continued to arrive years after all of the dogs were accounted for. Each dog was awarded a certificate of faithful service and honorable discharge. Every dog was shipped to their owner at the government’s expense, and all were given a kit consisting of their awards, a collar, a leash, and a copy of the War Department manual War Dogs. Once home, the soldiers, both man and hound, kicked the mud from their feet and bottled the ferocity they unleashed overseas, knowing that their courage and sacrifices had earned themselves and their countrymen, at last and at least, a few quieter days. couldn’t press out those doggy Valor badges fast enough. Bigger the dog the Bigger the boom.